Distant organ tumor dissemination is a major cause of breast cancer-related deaths. In 2010, we analyzed the prognostic importance of the circulating tumor markers (CTMs) cytokeratin 19 (CK19), CK20, epidermal growth factor receptor (EGFR) and human epidermal growth factor receptor 2 (HER2) in relation to the clinical and pathological characteristics of patients with breast cancer (BC). To assess the clinical utility of CK19, CK20 and EGFR in predicting distant metastasis in BC, here we report 7-year follow-up results of 77 patients. The patients with at least one positive CTM were classified as CTM(+) and those negative for all CTMs were assigned to CTM(-) group. In patients who received no treatment following CTM analysis, 25.0% had metastasis in CTM(+) and 10.0% in CTM(-) group. In patients who received one of the following therapies: chemotherapy, radiotherapy or hormone therapy, or the combinations of these therapies, the rate of metastasis was 33.3% in CTM(+) and 20.0% in CTM(-) group. Disease-free time was shorter in CTM(+) patients compared to CTM(-) group (28.83 ± 10.76 and 41.38 ± 9.5 months, respectively). According to multivariate Cox proportional hazard regression analysis, the presence of regional lymph node metastasis, Ki-67 expression, higher tumor grade and CTM expression status were predictors of poor prognosis associated with distant metastasis (p < 0.05). Also, CTM positivity was a factor associated with metastasis-related poor prognosis (HR = 0.492, p = 0.026). The mean survival for CTM(+) patients was shorter than that for CTM(-) patients (90.671 ± 2.66 and 101.23 ± 3.92 months, respectively; p > 0.05). Our findings demonstrate that CTM positivity may indicate a high metastasis risk; however, CTM negativity does not guarantee low metastasis risk. These results may encourage further preclinical investigation of CTMs, to evaluate the possible implications of these findings to the clinical setting. Klein CA. Parallel progression of primary tumours and metastases. Nat Rev Cancer 2009;9(4):302-312. Ferlay J, Soerjomataram I, Dikshit R, Eser S, Mathers C, Rebelo M, et al. Cancer incidence and mortality worldwide: sources, methods and major patterns in GLOBOCAN 2012. International Journal of Cancer 2015;1;136(5):E359-386. Eccles SA, Welch DR. Metastasis: recent discoveries and novel treatment strategies. Lancet 2007; 19;369(9574):1742-57. Ghossein RA, Bhattacharya S. Molecular detection and characterisation of circulating tumour cells and micrometastases in solid tumours. Eur J Cancer 2000; 36(13):1681-1694. Henry NL. The pathway to clinical use of a cancer biomarker. Scand J Clin Lab Invest Suppl 2016;245:17-21. Tunca B, Egeli U, Cecener G, Tezcan G, Gökgöz S, Tasdelen I, et al. 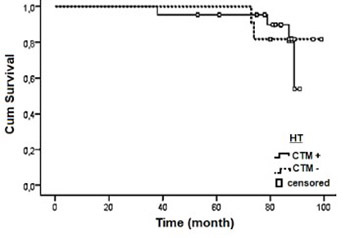 CK19, CK20, EGFR and HER2 status of circulating tumor cells in patients with breast cancer. Tumori 2012;98(2):243-251. Hess KR. Graphical methods for assessing violations of the proportional hazards assumption in Cox regression. Stat Med. 1995;15(15):1707-1723. Gervasoni A, Monasterio Muñoz RM, Wengler GS, Rizzi A, Zaniboni A, Parolini O. Molecular signature detection of circulating tumor cells using a panel of selected genes. Cancer Lett 2008;18;263(2):267-279. Colzani E, Johansson AL, Liljegren A, Foukakis T, Clements M, Adolfsson Jet al. Time-dependent risk of developing distant metastasis in breast cancer patients according to treatment, age and tumour characteristics. Br J Cancer 2014;4;110(5):1378-1384. Gradilone A, Gazzaniga P, Silvestri I, Gandini O, Trasatti L, Lauro S, Frati L, Aglianò AM. Detection of CK19, CK20 and EGFR mRNAs in peripheral blood of carcinoma patients: correlation with clinical stage of disease. Oncol Rep 2003; 10(1):217-222. Hu XC, Chow LW. Detection of circulating breast cancer cells with multiple-marker RT-PCR assay. Anticancer Res 2001; 21(1A):421-424. Haraldsson S, Klarskov L, Nilbert M, Bernstein I, Bonde J, Holck S. Haraldsson et al identified a higher freqeuncy in CK20 expression in familial colorectal cancer X patients in compare to Lynch syndrome. BMC Clin Pathol 2017; 17; 17:11. Early Breast Cancer Trialists' Collaborative Group (EBCTCG). Effects of chemotherapy and hormonal therapy for early breast cancer on recurrence and 15-year survival: an overview of the randomised trials. Lancet 2005;365(9472):1687-1717. Felton T, Harris GC, Pinder SE, Snead DR, Carter GI, Bell JA,et al. Identification of carcinoma cells in peripheral blood samples of patients with advanced breast carcinoma using RT-PCR amplification of CK7 and MUC1. Breast 2004;13(1):35-41. Hayes DF, Kiang DT, Korzun AH, Tondini C, Wood WC, Kufe DW. CA15-3 and CEA spikes during chemotherapy for metastatic breast cancer.Proc Am Soc Clin Oncol 1988;7:38. Kiang DT, Greenberg LJ, Kennedy BJ. Tumor marker kinetics in the monitoring of breast cancer. Cancer1990;15;65(2):193-199. Yasasever V, Dinçer M, Camlica H, Karaloğlu D, Dalay N. Utility of CA 15-3 and CEA in monitoring breast cancer patients with bone metastasis: special emphasis on “spiking ” phenomena. Clin Biochem 1997;30(1):53-6. Baskar R, Dai J, Wenlong N, Yeo R, Yeoh KW.Biological response of cancer cells to radiation treatment. Front Mol Biosci 2014;17;1:24. Thariat J, Hannoun-Levi JM, Sun Myint A, Vuong T, Gérard JP. Past, present, and future of radiotherapy for the benefit of patients. Nat Rev Clin Oncol 2013;10(1):52-60. Coleman R. Metastatic bone disease: clinical features, pathophysiology and treatment strategies.Cancer Treatment Reviews 2001; 27(3):165-176. Fang J, Xu Q. Differences of osteoblastic bone metastases and osteolytic bone metastases in clinical features and molecular characteristics. Clin Transl Oncol 2015; 17(3):173-9. Brook N, Brook E, Dharmarajan A, Dass CR, Chan A. Breast cancer bone metastases: pathogenesis and therapeutic targets. Int J Biochem Cell Biol 2018;96:63-78.